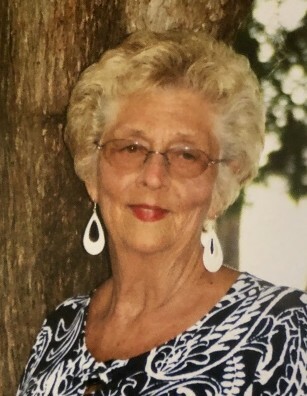 Ruby N. Preston Williams Ewing, a native of State Line, Mississippi and resident of Citronelle, Alabama passed away peacefully at her home surrounded by family on Thursday, January 17, 2019. She was a faithful member of Restoration Church of Citronelle and loved fellowship with her church family. She was a loving mother and “Nana” to her grandchildren. She was a precious lady and will be dearly missed by all who knew her. She was preceded in death by her husband, Delmar C. Ewing; father, J.W. Preston, Jr.; mother, Ruby Helen Preston Hartley; step father, James S. Hartley; and sister, Thelma Louise Preston. Those left to cherish her memory include her children, Jerome Williams (Kerry) and Ashley Ramey (Jerry); sister, Mildred Owens (James); brother, W.J. “Bill” Preston (Linda); grandchildren, Whitley Nicole Hopkins (Danny), Zachary Tyler Anders, Skyler D’Shay Williams, John A. “Trey” Smith III, Shelby Rose Smith, Christian Todd Williams, Bevin Brielle Williams; great grandson, Camden Daniel Hopkins; nieces, Teresa Owens Williams (David) and Kimberlee Michele Duncan; nephews, James Preston Owens (Debbie), Kevin Lee Preston (Brandi) and Kendall Brian Preston (Tracy); other relatives and friends. Mrs. Ewing loved spending time with friend of over 25 years, Peggy Oertel Conrad. She also enjoyed visiting with her dedicated and devoted sitter, Wanda Gatson Hill. The wake will be from 5pm – 8pm Saturday, January 19, 2019 at Restoration Church of Citronelle. The visitation will be from 1pm until the 2pm funeral service on Sunday, January 20, 2019 at Restoration Church with Rev. John C. Blackwell officiating. Burial will follow in Pine Crest Cemetery. The family would like to extend their appreciation to Amedysis Home Health of Citronelle, Hometown Hospice of Jackson, Alabama, Dr. Caesar Agagan, Dr. Steven Weinstein, Dr. Kenneth Burnham and Dr. Craig Kleinman. In lieu of flowers, donations may be made in Ruby’s memory to the Restoration Church Building Fund, 8520 State Street, Citronelle, Alabama. Online condolences may be given at www.freemancitronelle.com. Freeman Funeral Home – Citronelle, Alabama.